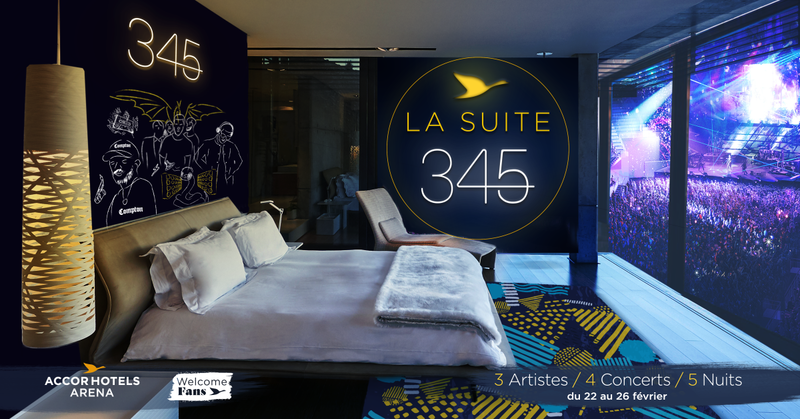 As part of a week of incredible concerts at the AccorHotels Arena in Paris, from February 22 to 26, the Welcome Fans by AccorHotels program is inviting fans of three internationally acclaimed artists to a unique experience in Suite 345. Stamping your feet in anticipation in the pit, jostling your way through the crowd to get a better view of your idol, jumping up and down until you can’t feel your legs... these are all hallmarks of a fan’s experience! But what if serenity, luxury and delight also formed an integral part of the live performance? Welcome Fans is offering a totally new experience by combining the intensity of a concert with the intimacy of a hotel suite, having completely remodeled one of the boxes in the AccorHotels Arena into a suite right in the heart of the venue. For a chance to win their key to the Suite 345, fans are invited to visit the dedicated page of the welcome.fans website between February 1 and 25. Designed as a search engine for hotel breaks, the event’s page lets visitors enter the date of their choice and select up to 14 friends they would like to invite to the suite and share the concert with. On the evening of the concert, seated comfortably in a 50m2 modern space with a warm ambience, the fans and their guests will enjoy an exceptional view of the stage. Throughout the evening, dedicated teams will provide a bespoke service and assistance, allowing guests to live their dream in a truly unique setting. And the end of the concert doesn’t have to mean a miserable journey home: fans will be invited to spend a night recovering from the excitement, before waking up to enjoy a must during any hotel stay, the unmissable breakfast. Suite 345 is a fresh illustration of the commitment of the Welcome Fans program to offer all fans luxury experiences and new opportunities to live their dreams to the full. With the Welcome Fans program, AccorHotels is enhancing the range of services that has been offered for more than 30 years to spectators, sportspeople and artists who attend or take part in the leading musical, cultural and sporting events of which the Group is a partner. AccorHotels is a world-leading travel & lifestyle group and digital innovator offering unique experiences in more than 4,200 hotels, resorts and residences, as well as in over 10,000 of the finest private homes around the globe. Benefiting from dual expertise as an investor and operator, AccorHotels operates in 95 countries. Its portfolio includes internationally renowned luxury brands such as Raffles, Sofitel Legend, SO Sofitel, Sofitel, Fairmont, onefinestay, MGallery by Sofitel, Pullman, and Swissôtel; the mid-range boutique hotel brands 25hours, Novotel, Mercure, Mama Shelter and Adagio; and very popular budget brands such as JO&JOE, ibis, ibis Styles and ibis budget, as well as the regional brands Grand Mercure, The Sebel and hotelF1. AccorHotels provides innovative end-to-end services across the entire traveler experience, notably through the acquisition of John Paul, world leader in concierge services. The AccorHotels Arena is one of the world’s leading arenas, along with Madison Square Garden in New York City and the O2 in London. Its recent renovation has added to its many strengths, which include its accessibility in the heart of Paris, its modularity (about 30 possible configurations) and its size (capacity of 20,300) combined with a range of high-quality services. The historically busy schedule of the 2016-2017 season (135 days of programming) and the 2017-2018 season (136 days of programming already confirmed) testify to the success and attractiveness of the AccorHotels Arena. For more information and reservations, visit accorhotelsarena.com.